Since 1995, the Celestis Foundation has donated funds to organizations that promote innovative projects that improve life on Earth and stimulate our ongoing exploration of the universe. The Foundation focuses on nurturing entrepreneurial space enterprises, supporting organizations that educate our children and the general public about space, and assisting charities that create a positive future on Earth. For example, the Celestis Foundation has sponsored the annual Frank J. Redd Student Scholarship Competition, which provides college students with the opportunity to share their work on small satellite concepts and missions at the annual AIAA Small Satellite Conference at Utah State University. Other Foundation recipients have included the X PRIZE Foundation, the Houston Urban Debate League and Women of Color in Flight. Celestis believes space should be opened to everyone. Its memorial spaceflights provide affordable ways for everyday people to fly in space, while its Foundation helps lay the groundwork for our future in space. Celestis is the only company on the planet to have successfully conducted Memorial Spaceflight missions. Visit us at Celestis.com for more information or to arrange a Memorial Spaceflight for yourself or a loved one. Celestis Chief Operating Officer Harvin C. Moore, left, shown with Frank J. Redd Student Scholarship Competition Scholarship winner David Bamber, center, and Gil Moore, one of the scholarship judges. This spectacular image of the sun shows yet another powerful solar flare that the sun has emitted in recent weeks. 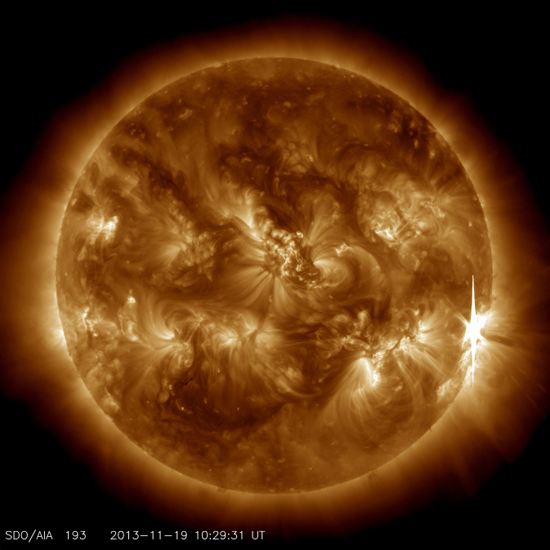 The image was taken Nov. 19 by NASA’s Solar Dynamics Observatory. You can fly a symbolic portion of your love one’s cremated remains on board a new solar observing spacecraft, the Sunjammer solar sail, which will give us even earlier warning of solar storms that could adversely affect Earth. Reservations are open: Contact us for more information. An X1-class flare erupts from the right side of the sun in this image captured by NASA’s Solar Dynamics Observatory on Nov. 19, 2013. The flare erupted from a region that produced many flares in its two-week journey across the face of the sun, and is shown here just before rotating out of view. This solar flare peaked at 5:26 a.m. EST (10:26 am GMT) Nov. 19. 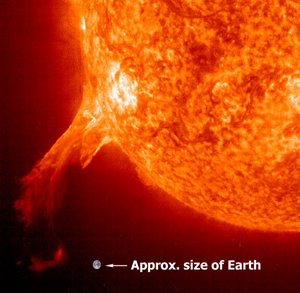 Solar flares are powerful bursts of radiation. Harmful radiation from a flare cannot pass through Earth’s atmosphere to physically affect humans on the ground, however — when intense enough — they can disturb the atmosphere in the layer where GPS and communications signals travel. This flare is classified as an X1.0 class flare. “X-class” denotes the most intense flares, while the number provides more information about its strength. An X2 is twice as intense as an X1, an X3 is three times as intense, etc. This flare came from an active region numbered AR 1893 that is just rotating out of sight over the sun’s right side. Increased numbers of flares are quite common at the moment, since the sun’s normal 11-year activity cycle is ramping up toward solar maximum conditions. Humans have tracked this solar cycle continuously since it was discovered in 1843, and it is normal for there to be many flares a day during the sun’s peak activity. 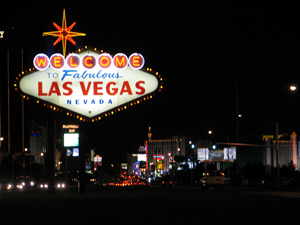 Celestis expands to Las Vegas! Las Vegas residents are used to living with the Sun. Now they can spend eternity orbiting it in space. The Davis Funeral Home Charleston Chapel in Central Las Vegas and Davis Funeral Home and Memorial Park Eastern Chapel are now offering families the opportunity to honor departed loved ones by flying cremated remains on a pioneering NASA mission that could orbit the Sun for millions of years. These two funeral homes are now the exclusive distributors in Las Vegas for Celestis Memorial Spaceflights, which has launched a dozen space burial missions since 1997. The NASA mission, called “Sunjammer,” is scheduled for launch in January 2015. Celestis’ parent company, Space Services Holdings, Inc., is part of a team of leading aerospace companies and government agencies – led by NASA – that is developing and launching Sunjammer, the world’s largest solar sail. Like a sailboat that harnesses the wind on Earth, a solar sail uses a large area of reflective material to harness the physical pressure of sunlight in space. The slight, but steady force of sunlight is free energy that can push a spacecraft just about anywhere in zero-g.
Sunjammer will be the largest solar sail ever flown – almost 13,000 square feet in area, about one-third the size of a football field. The spacecraft will serve to protect humanity by monitoring the Sun for dangerous solar storms, which can cause serious, long-term damage to electric utilities on Earth and satellites in space. With enough early warning of impending solar storms, engineers can minimize the damage such storms pose to our increasingly high-tech civilization. Another service that the two funeral homes are making available to Las Vegas residents is Celestis’ newest offerings, also on board Sunjammer: Celestis MindFiles™ and Celestis BioFiles™, which will permit people from around the world to include their photos, messages, music, art, and DNA on Sunjammer. Using Celestis MindFiles and BioFiles, Las Vegas families have the opportunity to take one last eternal trip together with their departed loved ones. 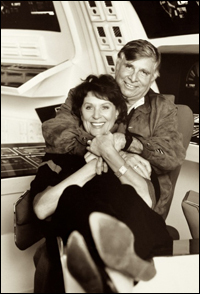 Also aboard will be the cremated remains of the late Gene Roddenberry (the creator of Star Trek), his wife Majel (the “First Lady of Star Trek“), James Doohan (who played “Scotty”), along with people from various walks of life. Visitors to these two Las Vegas funeral homes can learn more about Celestis and its various space burial options. In addition to the Sunjammer mission, families can have cremated remains launched into Earth orbit, to the Moon, or on a trip to space that returns the cremated remains to Earth. With this latter service, after the spaceflight occurs, the cremated remains – still sealed inside the space capsule – are returned to the family as a memento. Visitors can also pre-arrange a Celestis space burial for themselves. For more information, see www.davisfuneralservices.com/locations.asp and www.Celestis.com. Author CelestisPosted on November 13, 2013 November 18, 2013 Categories UncategorizedLeave a comment on Celestis expands to Las Vegas! Celestis’ Sunjammer solar sail is a NASA-funded starship that will travel many millions of miles toward the Sun, demonstrating – for the first time – a solar sail’s ability to fly and to navigate, as well as to provide early warning against the dangers of solar storms heading Earth’s way. This will also be a memorial spaceflight mission, carrying the cremated remains of people on this history-making journey. But what are these solar storms, and what dangers do they pose? From time to time, the corona will erupt, spewing (ejecting) huge amounts of charged particles (part of the mass of the Sun) into space. The danger is, if one of these CME’s impacts Earth, the charged particles — interacting with Earth’s magnetic field — can play havoc with electricity grids, radio communications, computer systems, etc., which could result in widespread chaos lasting for years at a time. In the modern era we have experienced relatively minor CMEs. But major CMEs have impacted the Earth in the past — well before the development of our modern, high tech society — and undoubtedly will impact us again in the future. For example, on March 13, 1989 a moderate CME caused an electric blackout in the Canadian province of Quebec that lasted approximately nine hours. But on September 1, 1859 a much more powerful CME impacted Earth. While we didn’t have computers, satellites and massive electricity grids at that time, we did have the telegraph: The 1859 CME’s impact on the world’s telegraph systems provides a cautionary tale for us today. During this CME, telegraph machines across North America, Europe, Australia and parts of Asia threw off sparks, shocking telegraph operators, setting small fires and effectively bringing down telegraph systems for two days. The 1859 CME is known as the “Carrington Event,” named after British amateur astronomer Richard Carrington who observed large sunspots and a massive solar flare at the time of the 1859 CME, and drew a connection to the effects observed on Earth. Carrington Events are estimated to occur approximately once every 150 years: It’s not a question of “if,” but of “when” the next one will head our way. When a Carrington Event eventually impacts our increasingly electronic, interconnected, wired society, the results could be catastrophic. In a 2013 report Lloyd’s of London estimates that a Carrington Event could leave 20-40 million Americans without electricity for up to two years! The most vulnerable areas for the United States, Lloyd’s reports, include: the New York City-Washington, DC corridor; the Midwest and the Gulf Coast. Imagine the chaos that would occur if a major urban area, such as New York City, lost electric power for two years — or even for two weeks! No electricity would mean no lighting, no power to pump water and run sewage systems, no refrigeration, no subways, no elevators, no air conditioning…. However, with enough warning of a CME, managers of electric utilities can take preventative measures to reduce the risk of long-term damage to electric grids. This is where Sunjammer enters the picture. 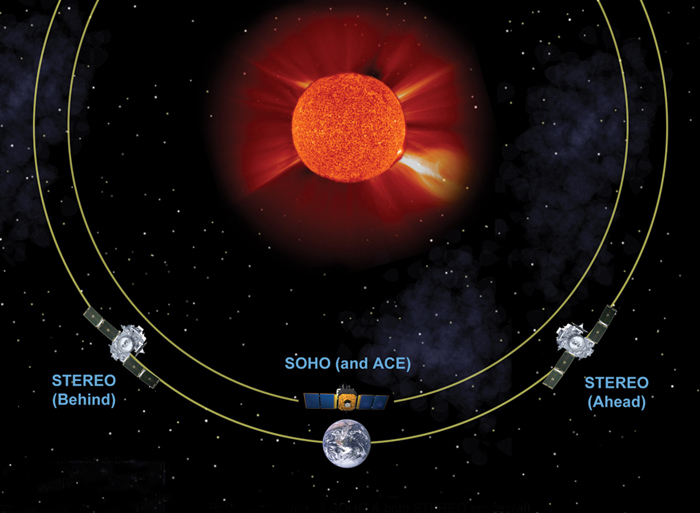 Four aging satellites currently monitor the Sun for CMEs. (See image below.) These satellites are located along Earth’s orbit, or at a special point (called “L1″) between the Earth and the Sun where the gravity of the Earth and Sun offset each other, allowing the satellites to remain in place without needing to use much fuel to maintain their position in space. Sunjammer will also fly to L1. Should this technology demonstration mission prove successful, future solar sail spacecraft could be positioned at points even closer to the Sun, providing earlier warning of CMEs. Because solar sails do not need to carry propellant – they harness the physical pressure of sunlight to travel through space – solar sails could maintain observing positions much closer to the Sun than conventional, fuel-burning spacecraft currently can. The Celestis Sunjammer mission will be truly historic, helping to defend Earth from dangerous CMEs. Reservations for this important mission are open. Pre-arrangements can also be made for yourself. Contact Celestis today for more information. Since 1995, the Celestis Foundation has donated funds to organizations that promote innovative projects that improve life on Earth and stimulate our ongoing exploration of the universe. The Foundation focuses on nurturing entrepreneurial space enterprises, supporting organizations that educate our children and the general public about space, and contributing to charities that create a positive future on Earth. A portion from the proceeds of each Celestis sale is donated to an individual, organization, or institution that embodies the spirit and principles of exploration, planetary conservation, and innovation so prevalent among our mission participants. For the last half dozen years the Celestis Foundation has been a Gold Sponsor of the Annual Frank J. Redd Student Scholarship Competition — a prime example of an educational initiative that is fostering the development of both students and the final frontier. 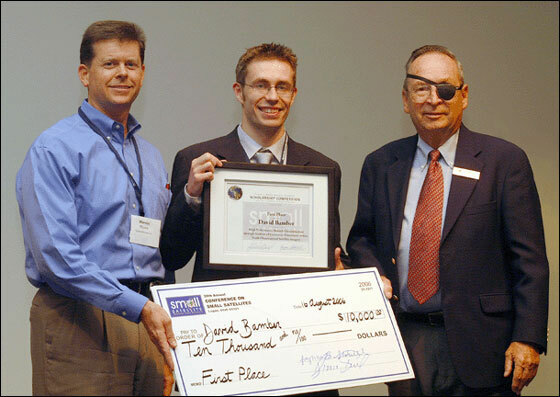 The Scholarship Competition provides college students with the opportunity to share their work on small satellite concepts and missions at the annual Small Satellite Conference. The AIAA/Utah State University Conference on Small Satellites has become internationally recognized as the premier conference on small satellites. We have also proudly supported the the X PRIZE Foundation, which, quoting from it website, is “an educational 501(c)(3) nonprofit organization whose mission is to bring about radical breakthroughs for the benefit of humanity, thereby inspiring the formation of new industries and the revitalization of markets that are currently stuck due to existing failures or a commonly held belief that a solution is not possible. The Foundation addresses the world’s Grand Challenges by creating and managing large-scale, high-profile, incentivized prize competitions that stimulate investment in research and development worth far more than the prize itself. It motivates and inspires brilliant innovators from all disciplines to leverage their intellectual and financial capital.” In fact, Celestis has an agreement with two of the Google Lunar X Prize Teams — Odyssey Moon Limited and Astrobotic Technology, Inc. — to launch payloads containing human cremated remains to the surface of the Moon as early as 2014/2015. In 2008 and 2009 the Celestis Foundation began its ongoing support of the Houston Urban Debate League by creating the League’s Web site. The mission of the Houston Urban Debate League is to build, support, and sustain programs in Houston’s public schools to make policy debate an educational resource available to all students. Policy debate prepares students to be effective advocates for themselves, their families, and their community. 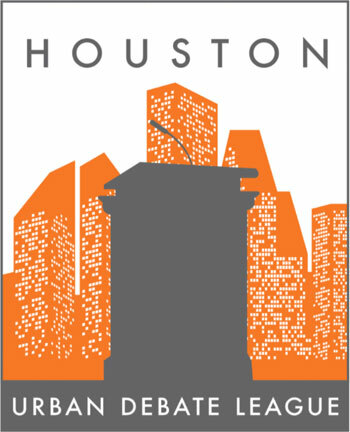 The Houston Urban Debate League develops public-private partnerships that enhance the investment of school districts in debate activities by providing business and community finance, mentoring, communication, and facilities to permanently restore policy debate in all of Houston’s public high schools. Celestis supports HUDL as a means to assist under-served high school students to pursue university education and careers in law and government. HUDL exemplifies the Celestis Foundation’s commitment to the future. The Celestis Foundation ensures a continuing source of support for the people and projects that will accelerate the opening of the space frontier and the preservation of Earth. We invite you to read more about the Celestis Foundation and the good work it does. This year marks the 4th Gwangju Design Biennale in Gwangju, South Korea; it is the largest design exposition in the world. The theme this year is a variation on “the way that is the way is not always the way,” the opening line of Lao Tzu’s Tao Te Ching. “Design is design is not design” asks people to look at design with a new vision, to ask where design can be applied to modern inventions. Where do creativity and vision overlap? When is design used to create bias or exclusion? “Its emphasis is laid on understanding the trends of domestic and international design and cultural phenomena and expanding publicity.”1 With this in mind all of the design fields represented are not be separated from each other and labeled but rather merged into a larger aesthetic display. Celestis has Brendan McGetrick to thank for being present at this exceptional event. Mr. McGetrick is a curator for the UnNamed themed section which explores “the ways in which design alters perceptions, reinvents, and reveals hidden truths.”2 Fields of focus include virtual communication, bioengineering, permaculture and more. Celestis has been incorporated into an afterlife design section and our service video plays on a large screen. Celestis certainly does alter perceptions and expectations about a funeral. The memorial spaceflight service for cremated remains has been called everything from fantastic, amazing, fulfilling, to creepy and strange. However you might choose to view the service, our goal here is to fulfill a dream, a desire, to provide for both the participant and the family. In the greater funeral world industry, it’s still a young service and we are honored to be a part of such a large honoring of design. The event runs September 2 through October 23. Continuing to be a company of worldwide mention, Celestis was discussed in a recent lecture at a professional symposium of Crematorium Administrators in Beaune, France. Pierre-Henri Therond spoke about the secularization of civil and religious ceremonies, the changing values associated with ceremonies and how professionals can work with these changes. Mr. Therond is the director of a company called Gracefully. Therond’s goal is to offer alternatives to traditional religious ceremonies while recognizing that all civilizations practice rites to celebrate the stages of life and that these celebrations bring us together both on an interpersonal and international scale. The company helps create ceremonies specific to the honoree, one that fits like a glove. For funerals, Gracefully proposes a service or celebration that reflects the image of the deceased and to make the occasion touching and unique. Many of Mr. Therond’s clients who come to him for funeral services are looking to plan their own funeral. These people seek to plan something that truly expresses who they are and what their life is about. Those planning for others are often trying to ensure that there’s a sense of dignity to the proceedings. It’s an overall ideal that’s well and succinctly explained on Gracefully’s wedding page. “It is the celebration that must adapt itself to the couple and not the inverse.” The idea being that celebrations shouldn’t come with a one-size-fits-all mentality but that you have options and are encouraged to explore those options to make the ceremony right for you. Mr. Therond’s speech was well received by the French audience and we thank him for including us in his speech about the changing funeral industry environment. Celestis celebrates the 50th anniversary of Yuri Gagarin’s historic spaceflight! 50 years ago today Yuri Gagarin became the first human to travel in space. His spacecraft, Vostok 1, was launched at 6:07 am GMT April 12, 1961 from the Baikonur Cosmodrome, located in the desert steppes of Kazakhstan, which borders Russia and China. Gagarin’s 108 minute flight took him around the Earth for one orbit. His historic spaceflight made Gagarin an international celebrity. Yuri Gagarin's Vostok 1 capsule at the RSC Energia Museum in Korolev, Russia, located just outside of Moscow. Like so many of the aerospace professionals who have flown on Celestis memorial spaceflights, Gagarin developed an interest in space travel and astronomy in his youth. He studied at a technical high school where he joined an aerospace club and became a pilot of small aircraft. He later attended the Soviet Air Force Academy where he graduated with honors in 1957. Unfortunately, Gagarin was killed in an airplane crash in 1968. In honor of his achievements, his cremated remains were buried in the Kremlin Wall. While the Soviet Union and the United States competed in the Cold War space race, the two countries cooperated in the final frontier as well. For example, in 1975 Mercury 7 astronaut Deke Slayton and two other astronauts docked their Apollo capsule in Earth orbit with a Soviet Soyuz spacecraft flown by two cosmonauts. This mission was called the “Apollo-Soyuz Test Project.” Slayton would later serve as President of the original Space Services Inc., to which Celestis traces its corporate roots. Today, astronauts and cosmonauts fly aboard the International Space Station and the space shuttle. In fact, April 12 is also the 20th anniversary of the first space shuttle flight. On this day in 1981, the space shuttle Columbia blasted off, marking yet another milestone in humanity’s venture into space. Consider celebrating this remarkable day in space history by attending the “Yuri’s Night World Space Party.” Parties are being held in communities around the world today – visit www.yurisnight.net to find an out-of-this-world party near you! Author CelestisPosted on April 12, 2011 April 12, 2011 Categories UncategorizedLeave a comment on Celestis celebrates the 50th anniversary of Yuri Gagarin’s historic spaceflight! What a wonderful day! The UP Aerospace SpaceLoft XL rocket carried the Pioneer Flight into space this morning. Liftoff occurred at 6:41 am MDT (8:41 am EDT, 5:41 am PDT, 12:41 GMT), shortly after sunrise – what a spectacular sight! You can view video of the launch here. The crowd of onlookers – including high school and college students and their instructors, VIPs, and family members of those on board the Pioneer Flight, applauded, cheered, jumped for joy, hugged one another … and cried. Family members in particular were deeply moved, knowing that their loved ones’ dreams of spaceflight have now been fulfilled. After launch, a number of dignitaries addressed the crowd in a huge tent erected for the occasion. Celestis family members and Celestis CEO Charles Chafer were interviewed. Vendors sold breakfast and drinks to the hundreds of people gathered for this historic event. Eventually, we boarded our vans for the return trip to the Elephant Butte Inn. A number of us slept on the way back: We had boarded the vans at 3:00 am for the trip to Spaceport America. Upon our arrival at the Elephant Butte Inn, family members again thanked Celestis staff for a successful – and truly meaningful – way of memorializing their loved ones. We were truly honored to have their loved ones aboard the Pioneer Flight. Author CelestisPosted on May 4, 2010 May 5, 2010 Categories Uncategorized2 Comments on We Have Liftoff! Our guests really enjoyed the launch pad tour this morning. We boarded our vans at the Elephant Butte Inn around 7:30 am, and arrived at Spaceport America around 9:00. The roads at Spaceport America are much improved from our launch here a year ago. Last year we rode over bumpy, unpaved, gravel roads, creating a minor dust storm in our wake! Since then, Spaceport America has paved the roads, making for a much smoother ride through the New Mexico desert. Pioneer Flight family members on the launch pad tour viewing the rocket on the launch rail. Note that the Celestis logo appears to the left of the "A" in "Lockheed Martin." We began by touring Mission Control, which is housed in a trailer about a mile from the launch pad. We were greeted by Tracey Larson of UP Aerospace, who gave us an informative presentation on the procedures mission controllers follow when they conduct a launch. Our guests had a number of questions, which UP Aerospace’s Bruce Lee answered. Then, we boarded the vans again and drove to the launch pad where we were met by UP Aerospace President Jerry Larson. He, and Celestis CEO Charles Chafer, discussed the launch scheduled for tomorrow morning, and took more questions from family members and other VIPs in attendance. Then, we all had an opportunity to walk around the launch pad and take photos. We returned to the Elephant Butte Inn around 11:00 am and rested. Then, at 4:00 pm, we conducted our Pre-Launch briefing, led by Celestis CEO Charles Chafer. Family members present spoke of their loved ones on the Pioneer Flight. We held the Pre-Launch Briefing in a banquet room at the Elephant Butte Inn. Perhaps Mr. Chafer’s most important piece of advice was to get to bed early as we have to board the vans tomorrow morning at 3:00 am! The launch is projected to occur at 6:00 am, and we have to leave early so as to be in place in plenty of time for the launch.